Authentic handcrafted log homes are synonymous with beauty and artistry. From the large, tapered, hand-peeled logs to their meticulous stacking, the intricate workmanship of skilled craftsmen brings out the natural beauty of the wood. This rustic authenticity beckons the viewer to recall a past when craftsmanship was a part of everyday life. 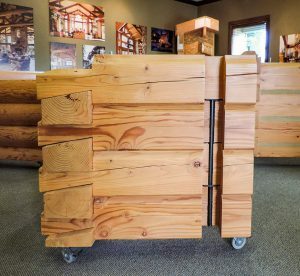 Aside from some of the tools, and a few modern engineering methods and materials, handcrafted log homes are cut and assembled the same way they were a hundred years ago. Each log is meticulously hand-cut and hand-hewn for a specific location within the structure. And, chinking is still in use to seal the gaps between the log courses. As a result, handcrafted log homes have a rustic feel. Visit an authentic handcrafted log home, you will see each horizontal cut from the drawknife and every carefully carved notch. This texture is a visible reminder of the craftsmanship that goes into every individual log and connection in the home. 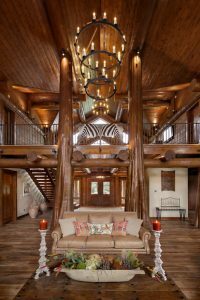 In addition, large-diameter logs combine with soaring cedar flared character posts to create an impressive statement. Owning a handcrafted log home means you own a handcrafted work of art. Our lifestyles have changed dramatically since the days of single-room cabins. 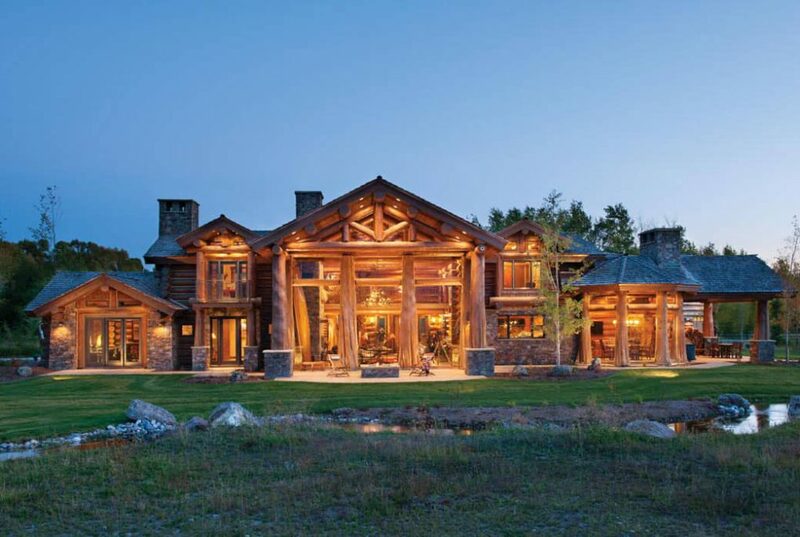 Today’s handcrafted log homes are some of the most impressive mountain-style homes ever built. They go well beyond the functionality of the single-room log cabins of old. Bold log posts support entryways and porticos that welcome friends and family to gather and share memories. Once inside, flared character logs make an impressive statement in the great room. Vaulted ceilings, giant log trusses, and walls of glass enhance the home’s interior. Modern kitchens are open to the rest of the home and mix stainless steel, stone, and other textures with chinked log walls to create the perfect spots for relaxing and entertaining. Finally, at the end of the day, owners escape to luxurious master suites. These rooms often include jetted tubs, private outdoor spaces, and the anticipation of waking up to priceless vistas framed in the warm hues of wood. Modern engineering methods enable builders to create amazing handcrafted structures that meet the most rigorous building codes. PrecisionCraft employs the Houseal™ Non-Settling System. Using this patented steel pin-and-pipe method, they can build complex handcrafted homes in locations with strict building codes, such as California. When you combine the craftsmanship of yesterday with the modern advances of today, the resulting handcrafted log homes are beautiful, functional, and authentic.